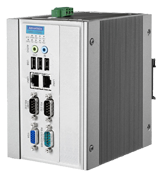 HTE Automation offers Advantech Automation connectivity and industrial automation control products including industrial PCs, managed and unmanaged Ethernet switches, network interface adapters, HMIs, communications gateways, motion control function blocks, and touch screen computers. Their reliable PC-based automation technologies are an ideal choice to improve productivity and efficiency in any application. HTE’s TECHTEAM is committed to helping you meet specific application needs with exceptional service and product knowledge. We are available to assist with any product decisions, installation, or preventative and repair services. Our broad range of support services provides maximum efficiency and flexibility to our customers, aiming to extend the life of your product. Advantech’s manufacturing automation technology and controls are suitable for many applications across a wide range of industries. Industries that commonly use their automation products for production, packaging, and transportation include medical, retail, healthcare, logistics, building, and power and energy due to their ability to meet demanding requirements. Automation systems and components from Advantech offer reliable, flexible solutions for many applications. HTE Automation is your resource for all Advantech product needs if you are located in Kansas, Missouri or Illinois.